This article provides some technical details for the SAML standard, used for SSO (Single Sign-On). SSO (Single Sign-On) allows you to use your own authentication servers to authenticate accounts on the lookback.io service. This way, you can centrally manage people enrolling or getting off-boarded in your own LDAP or similar. SSO is only available on our Enterprise plan. Once you have upgraded, navigate to top-right menu > Organization Settings, and follow the instructions in the section "Single Sign-On". Lookback currently supports SAML as authentication service. To configure SAML to work with Lookback on your end, see our field definitions and public key below. 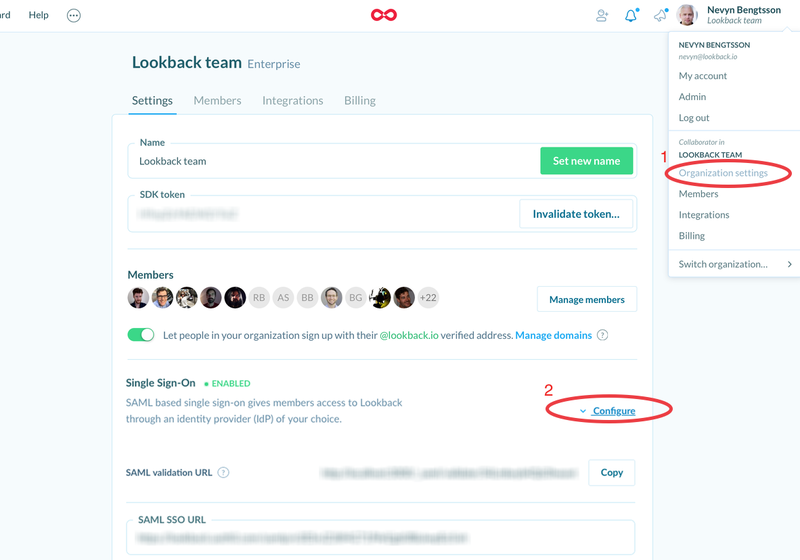 Please contact us at help@lookback.io if you've got further questions, but please note that we can only help with Lookback specific SAML question; we cannot reply to technical questions regarding the SAML specification itself. SAML Validation URL: Your Identity Provider (IdP) should send the SAML response to this URL. SAML SSO URL: The SAML 2.0 endpoint that our servers should redirect to to authenticate the request. Identity Provider Issuer: An identifier/name for your Identity Provider (IdP), usually a url like https://yourdomain.com. Public Certificate: Your IdP's public certificate. If you have more advanced requirements, we offer a few optional settings too. Sign AuthnRequest: If you require us to sign the SAML request we will do that using the public key below. You can specify the algorithm you'd like us to sign it with. We support rsa-sha1, rsa-sha256, and rsa-sha512. Encrypted Assertion: Should you wish to encrypt the assertion you may also use the certificate below. You can find a link to view the SAML Metadata in your team's SSO settings.